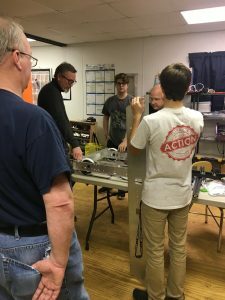 Buzzing saws, group chatter, banging hammers, and lots of laughter have been echoing from the workshop during these weeks of build season. The team has been putting in many hours after school and on weekends to construct the robot, figure out the Java program, get the word out about our team, and find innovative solutions to our roadblocks on this route of discovery. We have just a few days left with so much left to finish. We’re confident that our team can work together in these critical hours to accomplish the goals we set in the beginning of the build season. 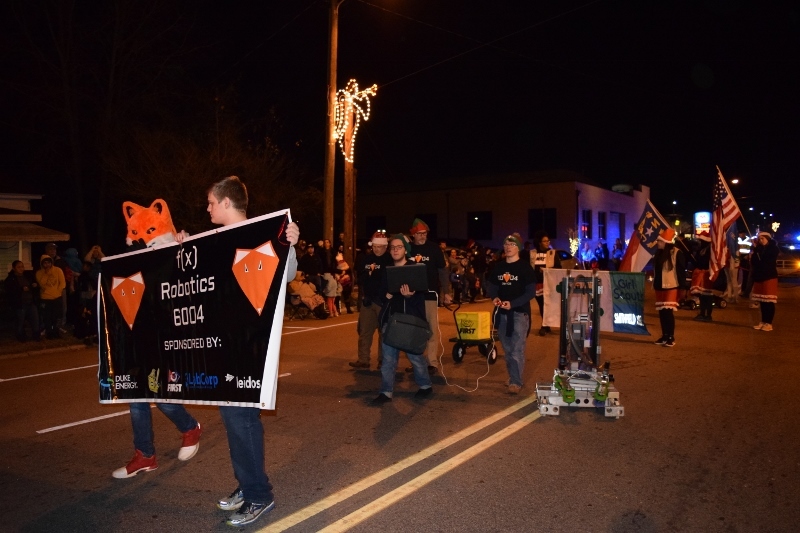 Team 6004 got a chance to participate in the 2018 parade hosted at Smithfield NC. We had a grand time showing off the robot, though the group in front of us was a little skittish by the end of it! 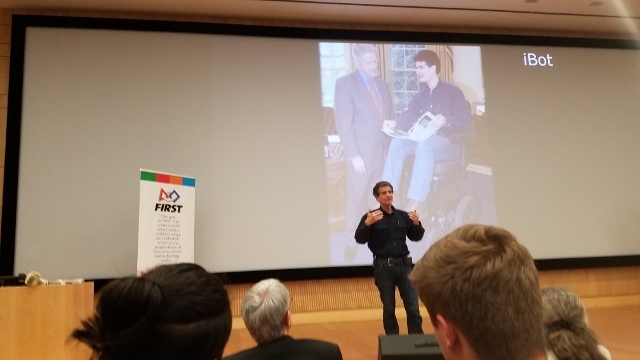 The team got a chance to sit down at a talk hosted by Dean Kamen at NC State University Friday evening. It was an awesome chance to see live what most often you have to watch from a small television or computer monitor. Dean has a very commanding presence and the team had a wonderful time with the experience. 2019 – So Many Changes! There’s many exiting changes sweeping through Team 6004. This year the team is going to be transitioning away from LabView and jumping into the realm of Java! And in keeping up with the supported means coding and deploying to the robot, Team 6004 is exited to be moving to Microsoft VS Code and GradleRio! Stick around as this is just the beginning of an excellent start to the season. Another Build Season Is Here! 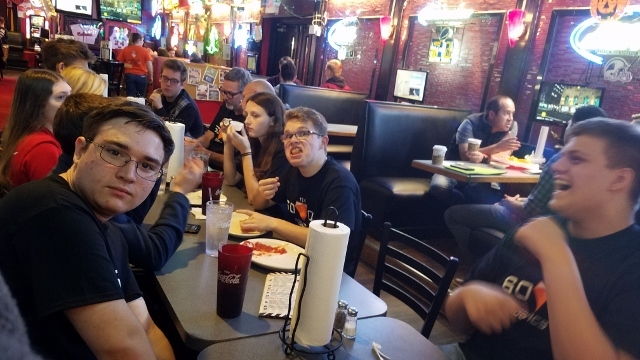 Team #6004 is excited that another Build Season is here! We are hoping to have more sponsors which we will feature on our website as well. This was the FIRST organization’s Teaser Video and we were intrigued! Our team will be hard at work (and enjoying every minute of it) for the next six weeks! Sign Up For Our Robotics Summer Camp! 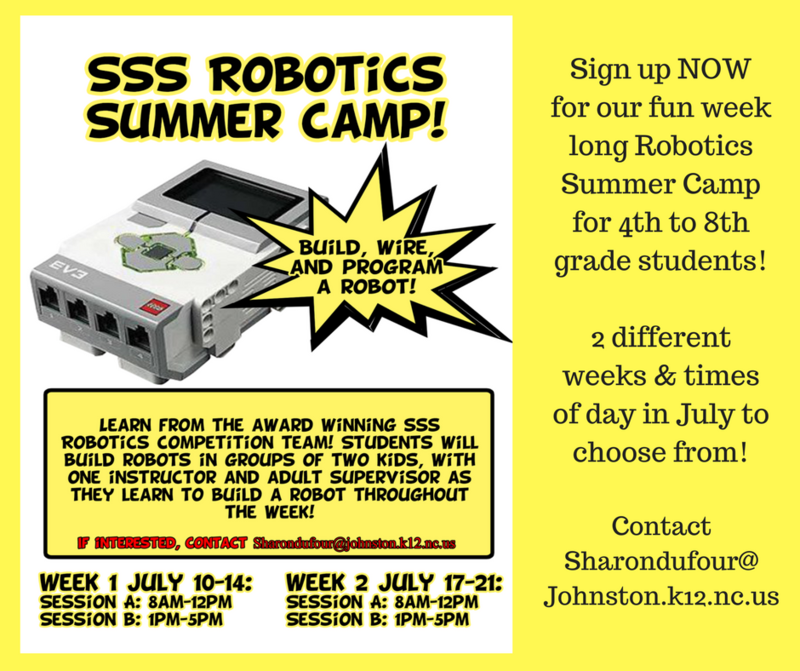 SSS Robotics is pleased to announce our Robotics Summer Camp! 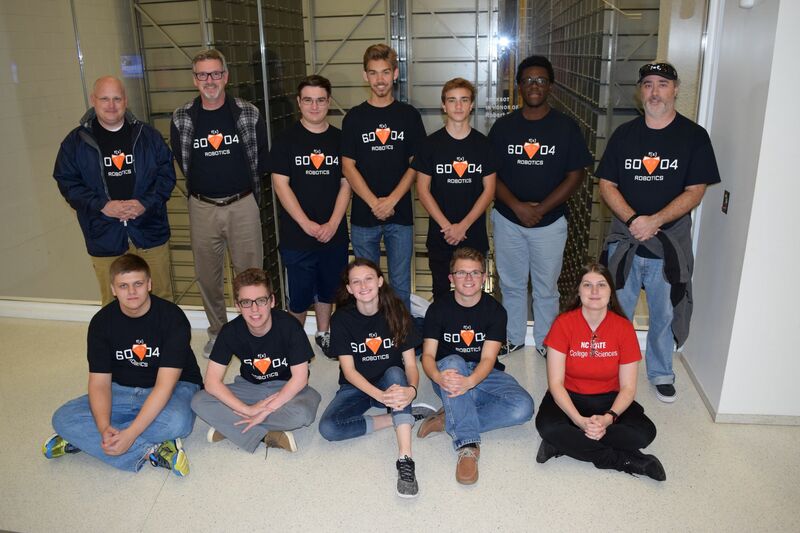 Learn from the award-wining SSS Robotics Competition Team! Students will build robots in groups of two kids, with one instructor and adult supervisor as they learn to build a robot through the week long camp. Our summer camp is designed for 4th to 8th grade students. We offer two different weeks and times of day in July to choose from. The first week (July 10-14) students can participate in Session A (from 8 am to 12 pm) or Session B (from 1 pm to 5 pm). The second week (July 17-21) students can participate in Session A (from 8 am to 12 pm) or Session B (from 1 pm to 5 pm). Rick Phillips and Sharon Dufour lead our FRC (First Robotics Competition) Team #6004 at Smithfield Selma High School. We are interested in helping younger students get started. This past year, our team earned first place at a tournament in Raleigh! Some of those same students will also be at this fun robotics summer camp. 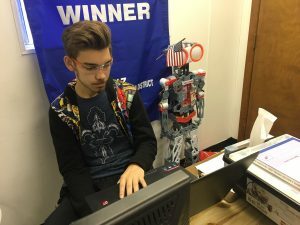 Did you know that colleges like to see Robotics on student applications? 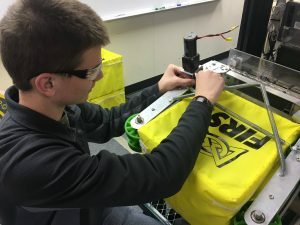 FIRST Robotics even offers scholarships to seniors in high school. Robotics students can go on to pursue successful careers, especially in the areas of science, technology, engineering, and math (STEM)! There is no high school activity more like the real world where you are helping to make engineering decisions and learning other skills like leadership and marketing. The networking opportunities you have with competent, intelligent, hard-working, and ambitious students. You get to be your wild crazy self (many of the teams have their own colors, uniforms, and even mascots)! The great scholarship opportunities available from a variety of schools. The gracious professional environment where students work with and cheer on other robotics teams. We love FRC Build Season.